Creative CT2950 Sound Blaster 16 audio / CD-ROM controller 16-bit ISA card with Yamaha Sound Daughter Board DB50XG. 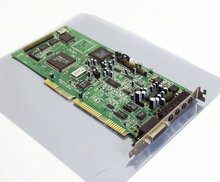 Sound Blaster audio / XG MIDI card / CD-ROM controller card for use with 16-bit ISA slot (IBM PC AT compatible computer). Includes Yamaha Sound Daughter Board DB50XG, made in Japan. This item was last tested in February 2019. - Both sound card and wavetable board worked fine on speaker output; produced a clear sound without noise. Wavetable board could play samples fine (sample disc not included).